Paskutinis atnaujinimas: 2004 m. lapkričio 11 d.
Welcome to X-LT Home Page ! 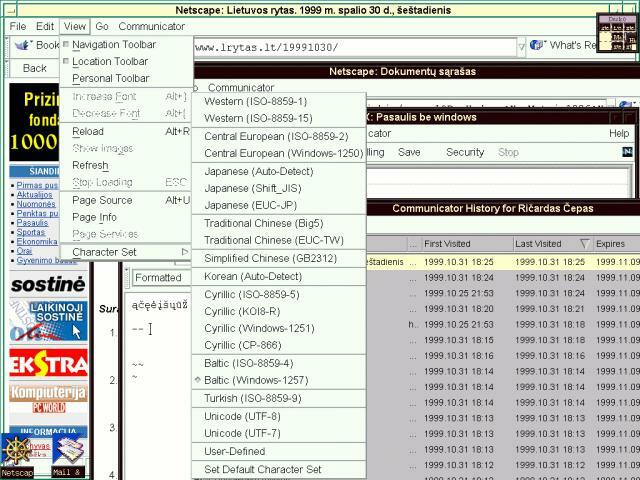 Included: keymap, Unicode UTF-8 locale, utilities, installation scripts to setup TTF font directory for xfsft, script to add Baltic encodings to Netscape v4.5-4.x instead of Greek, long instructions about localization and internationalisation in English and Lithuanian and other stuff. Palaiko visas palaikomas iconv bibliotekos koduotes, taip pat visas senas WG-15 lokalių vieno baito koduotes'us (daugiau kaip 150), papildomos gali būti pridėtos be kompiliavimo. Gali perkoduoti MIME laiškus su dalimis esančiomis viena kitoje. Gali iškviesti kitas utilitas kai reikia perkoduoti senus kelių baitų kodavimus į Unikodą. Supports all charsets supported by iconv library and WG-15 locale single-byte legacy char-sets, new ones can be added without recompiling. Can decode nested multi-part MIME messages. Can invoke external filters for conversion of unsuported by iconv legacy char-sets to unicode. -i only raktas nurodo konvertavimui naudoti tik iconv biblioteką ir nenaudoti konfigūracijos failo. ftp.funet.fi - up-to-date mirror of various FTP sites. ftp.freebsd.lt - FreeBSD mirror. cvsup.freebsd.lt also works. Lietuviška e-pašto konferencijos apie įvairias OS. Siųskite laišką su žodžiais „subscribe os“, „subscribe os_bsd“, „subscribe os_linux“ laiško viduje į serv@konferencija.lt. Yudit - easy to use Unicode editor for X. It has an utility to generate Postscript output for printing using True-Type fonts. Also has Lithuanian keymap and can use True-Type fonts for display. QEmacs - emacs style editor with UTF-8 support. sted - simplistic Unicode editor for Linux console. Latest version of XFree86 xterm as well as that included in XFree86 4 can handle UTF-8 if that feature wasn't disabled at compile time. It uses ISO 10646 (Unicode) fonts. 'Less' pager from version 3.44 can display UTF-8. There was patch by Marcin 'Qrczak' Kowalczyk for bash 2.02. I have modified it slightly to work with any terminal and bash-2.02.1, and later with bash 2.04 using version from Unicode HOWTO. Note that version from Unicode HOWTO is not mine and is unportable linux version. It detects UTF-8 locale by searching for "UTF-8" substring in LC_ALL, LC_CTYPE, LANG and MM_CHARSET environment variables in that order. enable-utf8-mode inputrc option is not used in this version - it is redundant. Here is kxkb patch that allows to use default locale charset as Qt gets from environment it instead of setting it by kxkb to arbitrary value. Alternatively you can edit ~/.kde/share/config/kxkbrc and change all encoding names to UTF-8 or just delete encoding strings to use libc locale encoding (LANG and LC_.. variables) but you will need to repeat this every time you use kxkb configurator. UTF-8 support is included in the GNU troff v1.16 used by man. 9term was first Unicode aware Plan 9 terminal emulator for X. It uses Plan 9 style Unicode fonts. Such text editors as Wily, Sam can use these fonts. Supports True-Type Unicode and other fonts, can remap Unicode fonts to ISO-8859-*. 'xfs' binary [~210kb] or X server for FreeBSD or Linux you can download from here if you can't upgrade to XFree86 4. 'fonts.scale' is generated by separate ttmkfontdir utility. XFree86 4.0 includes bitmap fonts and Bigelow & Holmes scalable Type1 postscript fonts with Lithuanian letters and reencoding capable software. New XFree86 Render extention with antialiasing support. Still experimental at the time of XFree 4.02. MSIE fontpack. Free of charge. Includes most popular Monotype and Microsoft families. It is in .exe format however and you will need MS-Windows to unpack it. Cyberbit True-Type Unicode font. Free for personal use. It isn't available anymore from Bitstream but you can try Netscape site. Fonts in True-Type format can be used on various OS's. Yudit can use these fonts. Fonts in True-Type format can be used on various OS's. Wprint is Netscape postscript postprocessor and can be used to print text in different encodings using Unicode True-Type fonts. Linux i18n project by major Linux vendors. Citrus Project - a i18n framework towards BSD systems. Omega Project - multi-lingual type-setting system based on Tex.